There is no denying that one of the most outstanding ancient sites in the world is Petra, Jordan. There is nothing in the world which could come at par with the magnificence of this rose-red, rock-carved city that is filled with mystery and charm. Many visitors swear that the city was actually designed to strike awe and wonder into anyone who entered it. Petra is said to be the most beautiful and most famous sites in Jordan. It is 133 km North of Aqaba and about 262 km south of Amman. It serves as the legacy of the industrious Arab people called Nabataeans who settled in South Jordan over 2000 years ago. It is also a UNESCO world heritage site and belongs to the New 7 Wonder of the World which continuous to enchant tourists all over the globe. It is notable for its refined culture, magnificent architecture, and ingenious complex of water channels and dams. 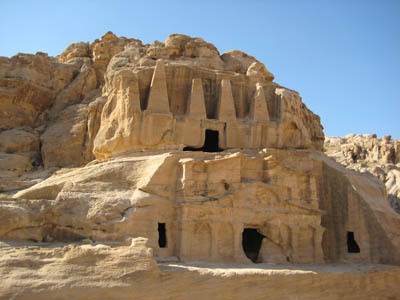 One of the sites you must not miss when you are in Petra is the famous monument of El-Khazneh. Its intricate façade glows in the sun as it faces the opening of the city’s gorge. This gorge, on the other hand, is one kilometer long and has beautiful steeply rising sides. Petra, Jordan has always been a lovely place even during the reign of the Roman empire. It has more than 800 monuments — including tombs, buildings, funerary halls, temples, colonnaded streets, arched gateways, and even baths– which will absolutely take your breath away.